Is your doctor unable to ease your chronic pain? Do you have pain after surgery that is not going away? Does your dental pain keep you awake at night? Imagine – you enjoying being healthy and CALM and detached from pain! Hypnosis has been used to relieve chronic pain for years. Surgery pain is a trauma. The fear of the surgery, the stress on the body during surgery, the discomfort afterward… all of this creates a powerful and sometimes repetitive loop in the brain. This can make the pain continue long after the physical symptoms should be gone. 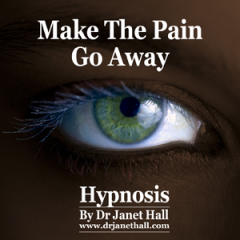 Dr Janet Hall’s “Make The Pain Go Away” hypnosis recording will get YOU to go deep inside and experience physical release of pain. You can experience this deep healing and resolve your pain. Maybe this is just what you have been waiting for! This method will resolve the emotional pain, create a healing condition in the body, and release the pain. So, if you’re serious about wanting to be pain-free then you need to get a copy of “Make The Pain Go Away With Hypnosis” right now!